If you are drawing or painting motifs by hand, it is common practice to create them individually and then move them around collage-style until you land on a layout that you are satisfied with. With computers making the “collaging” step a much easier and cleaner process, I would say that that this is the most common way that layouts are arrived upon today. However, I find that when I want lots of interaction between my motifs and interesting ground fill in the negative space, the most effective technique is to actually draw it in repeat. This is more time consuming than arranging motifs on the computer, but I think it’s worth it in the end when you have a beautifully interlocking repeat. The first step is deciding on the size of your repeat. This used to be a step with much more steadfast rules, but in the digital age it’s not quite as important because a design can always be resized. This is more just to visualize the scale and to choose the appropriate size for you in terms of the practicalities of painting it. Once the size of the repeat is determined, I mark it off on a sheet of paper that is bigger than the size of the repeat (in this case, multiple sheets of paper taped together). 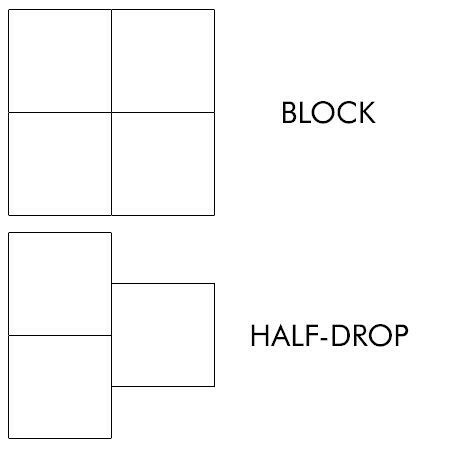 Because I wanted this design to have a lot of movement and not have a pronounced feeling of repetition, I decided to make it a half-drop layout as opposed to a block layout. In a half-drop layout, the horizontal repeat drops halfway down the length of the repeat, creating diagonal movement. After graphing out the borders of the repeat, it’s time to start drawing! This is the first physically creative step in the process of making a design, and one of the most exciting. I usually start by drawing sections that don’t touch the edge of the repeat so that I don’t have to worry about it until I get a little more established in my design. I begin with a primary motif, drawing very loosely, always in pencil (preferably 2B). It’s important at this stage to not get too attached to anything you put down. You need to be ready to alter, move, or entirely discard any element in order to achieve dynamic balance and flow in your layout. For my “Paradise Fusion” design, I knew from the get-go that the driving force behind my layout was going to be a structure of branches, because my original inspiration was the seminal Tree of Life design. This provided me with a certain amount of logic to ground my motifs, as flowers and leaves could extend off of the branches as they do in nature. However, I also knew that I didn’t want to get too caught up in any sense of realism. I wanted to be able to incorporate nonsensical scale, changes in specimen and style, and motifs that float on the ground without a supporting structure. In order to establish this, the second thing that I drew immediately after some primary flowers was designed ground space filled with secondary motifs. This is not how I would usually tackle this stage of the process, as I would typically wait for all of the primary motifs to be laid out in a structure and then fill in negative space with secondary motifs. With a small section of primary and secondary motifs complete, I continued on to broadly lay down strokes of the overall foundation, which again, is the branches. From there I added in primary and secondary motifs section by section as delineated by the branches. After a certain point, I had reached some of the edges of the repeat and felt that I could not continue until I could see where the elements would fall once put into repeat. Without a light box, you can solve this problem by using transparent paper to trace over completed sections of the drawing and taping those pieces where they would repeat. However, this isn't ideal, as it risks sacrificing accuracy and the drawing doesn't all end up on one surface. The best way is to use a light box to trace over completed sections and then retrace those tracings onto the original surface in the spot where they would repeat. It's not the most efficient process, but it works—you just have to make sure that you are careful with your tracing. Once I had filled in some of the repeating elements, I could clearly see where my spatial limitations were in the undrawn areas, and I could fill them in. Because this design had so many disparate elements, one of the design fundamentals that became very important was repetition (within the repeat). Showing the same type of motif more than once within one repeat helps it to feel less random and adds to the visual balance of the overall design. 15 specimens of flowers, 5 insects, 3 birds, 2 ibexes, 1 snake, and hundreds of little secondary motifs later, I have a completed layout! Now all I have to do until I can begin painting is lightly trace the entire thing onto watercolor paper, edit and refine almost all of the shapes, and then lightly erase the entire surface...and that's all before the painting begins. Here we go!